My Garden is ‘for the birds’! Not sure why that phrase ‘for the birds’ denotes a negative connotation; I absolutely love the birds that come to visit my garden. For that reason, I have bird feeders and bird baths at various locations throughout my garden and I make sure to plant things that will bring them in. 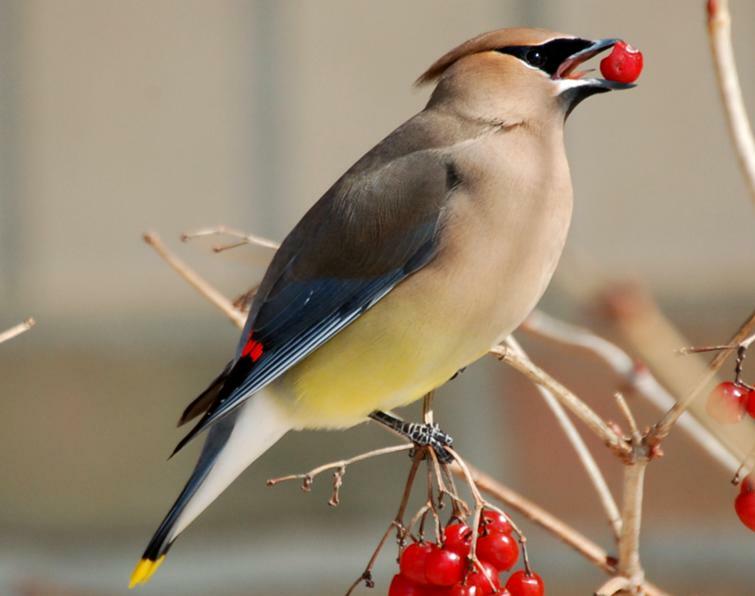 Year before last, I was lucky to be visited during Spring migration by a huge flock of Cedar Waxwings — probably 50-60 of them were sitting in one of the Silver Maple trees in my front lawn and flying back and forth to visit the Mountain Ash tree across the street. The birds would fly back and forth, gathering and eating the berries that had been fermenting all winter. How amazingly funny to watch them getting tipsy as they gorged themselves on the berries (dropping them all over my driveway in the process)! A wonderfully enjoyable day where I got nothing done but watching the birds! Juniper – remember: juniper berries are a basic ingredient in gin. No wonder the birds love them! Elderberry – the flowers add a lovely aroma to your garden, while the berries are delicious for both birds and people. Elderberry jam or wine is absolutely delicious. Bayberry – I have two of these (one purple / one yellow) in my garden, but recent studies question whether these shrubs are a threat to public health. 20 states have named the Japanese Barberry as an invasive species and a restricted plant in Wisconsin by the DNR. If you have these shrubs, as I do, it’s important to keep them contained. The branches have thorns, making it a perfect hiding place for small birds, and the berries provide sustenance in the winter but, unfortunately, allow the spread of the seeds of this aggressive shrub. The smart thing is to eventually replace them with something more environmentally friendly. Use those herbs you’re growing! Do you grow herbs in your garden and, then, do nothing with them? Or maybe you dry them for use through the winter but that’s about it. Our own herb specialist, Mary Learman, has created many, many recipes and will be sharing them with us. This one is especially good spread on fresh baked bread! Toss this herby pesto with pasta, spread it over sandwiches or stir it into an Italian-style soup, like minestrone. Toast nuts – bake in a shallow pan in a 350° oven for 5-10 minutes or cook in a skillet over low heat until lightly browned, stirring occasionally. Place basil, parsley, almonds and garlic in a small food processor; pulse until chopped. Add lemon peel, juice, honey and salt; process until blended. Continue processing while gradually adding oil in a steady stream. Add cheese; pulse just until blended. 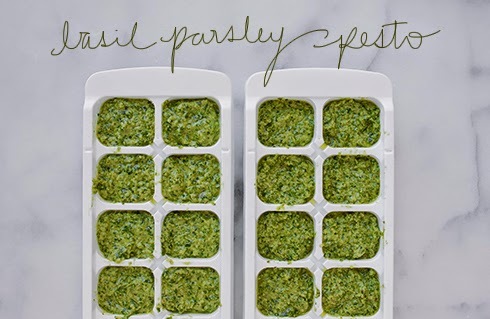 Freeze option: Transfer pesto to ice cube trays; cover and freeze pesto until firm. Remove from trays and transfer to a resealable plastic freezer bag; return to freezer. To use, thaw cubes in refrigerator 2 hours. Tips to Keep Your Canning Safe! Remember the old stories about folks getting sick from eating someone’s canned green beans? I found out that was E.Coli! Nothing to mess around with. When you have a pile of rhubarb, tomatoes, or other fruits and vegetables take care to preserve them correctly so you don’t endanger yourself or others and so that you don’t waste your harvest. The following tips are from a lovely article by B. Ingram written in 2011. 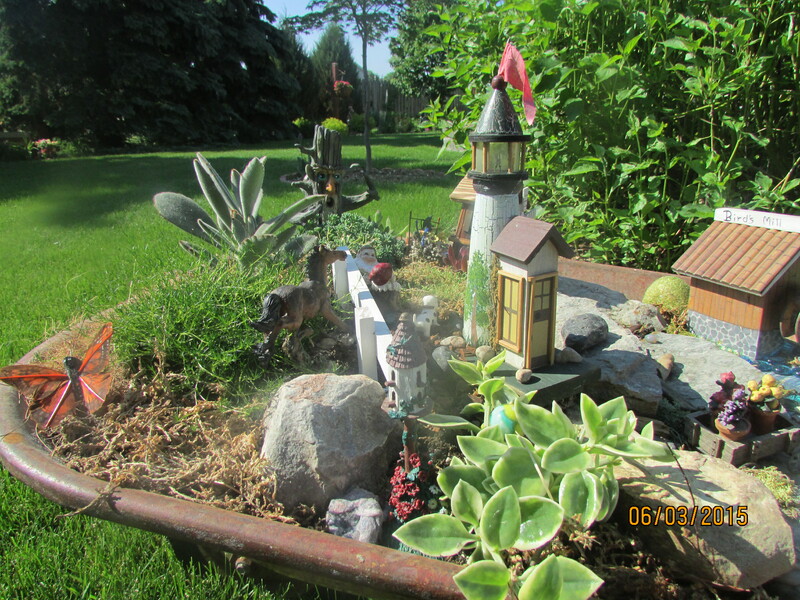 The article is from the UW Extension which is a great resource for articles on all kinds of topics to enhance your summer and your garden. Here’s a link to the article if you’d like to view it, http://outagamie.uwex.edu/files/2011/06/Tips-for-a-Successful-Home-Canning-Season2.pdf, but here’s a summary. First, start with a well tested recipe and there are plenty of resources to find these. 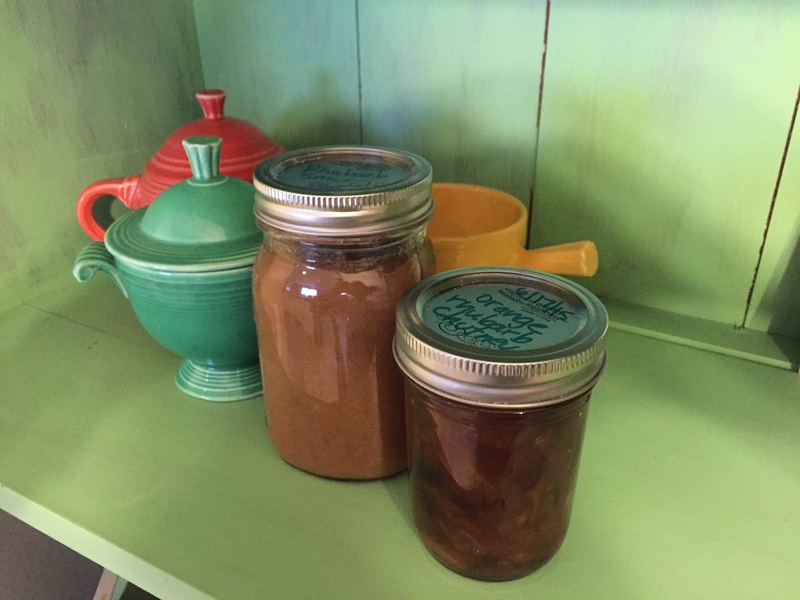 You can visit The National Center for Home Food Preservation at http://nchfp.uga.edu/ or in Wisconsin the resource http://www.foodsafety.wisc.edu/. Use recipes that are up to date and equipment that is in good working order. If you are using a pressure canner there are resources for having them tested every year which is recommended by the Extension. Make sure your jars and screw rings are in good shape and sterilize them before use. Discard any jars that are chipped and toss any rings with rust. Purchase new lids every year, don’t ever try to re-use the lids! And the final tip from the article discourages using our creativity when it comes to canning! I guess we can save the creativity for the garden where it doesn’t have such a direct effect on our food safety. Thanks to Mary for bringing the article to our attention! Preserving some of the year’s rhubarb! Chutney and sauce for later this year! There are others, of course: Attack of the Killer Tomatoes, Little Shop of Horrors, White Oleander, Under the Tuscan Sun, Grey Gardens, It’s Complicated and practically any period piece from England (e.g. Howard’s End, Pride & Prejudice, Great Expectations) will feature gorgeous gardens and ladies with big gardening hats, pruning shears, and a basket of lovely cut flowers. 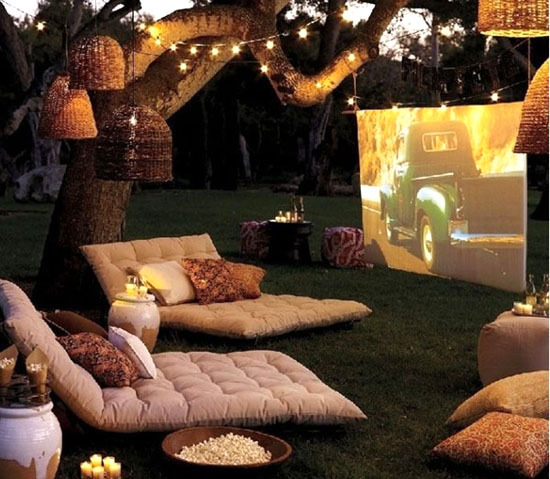 Now, if I could just set up a projector, screen, and popcorn machine out in my garden, I’d be all set for the summer! If you’re like me, you love the big, beautiful mop-headed peonies each Spring. 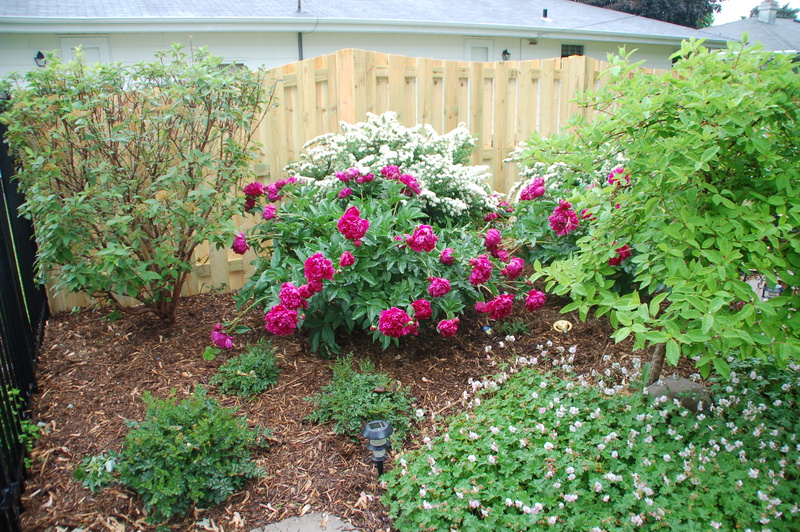 Maybe you even have a peony garden and lovingly research and plant specific cultivars. Unfortunately, that isn’t always the case, though, as we share our plants each year. Such is the case in my garden. I have two lovely big Karl Rosenfeld peony bushes that give me gorgeous deep red blooms every year. In another part of my garden, I have two Bartzella peony bushes that should bloom for the first time this year (fingers crossed) and give me big yellow flowers. However, I also have a couple that were gifts so I don’t know much about them at all; one is too small to even bloom yet, but the other has bloomed for the first time and produced beautiful delicate pink blooms. It was just a delight! I did a little research online and found that there are dozens of peony cultivars with pink blooms and, while maybe it would be nice to know exactly what it is, I’ve decided to just enjoy the beauty instead. Sometimes I think we get too caught up in the organization and identification of everything in the garden when, instead, simply enjoying the beauty and fragrance is the much smarter choice! Come see us at the Appleton Farmer’s Market! 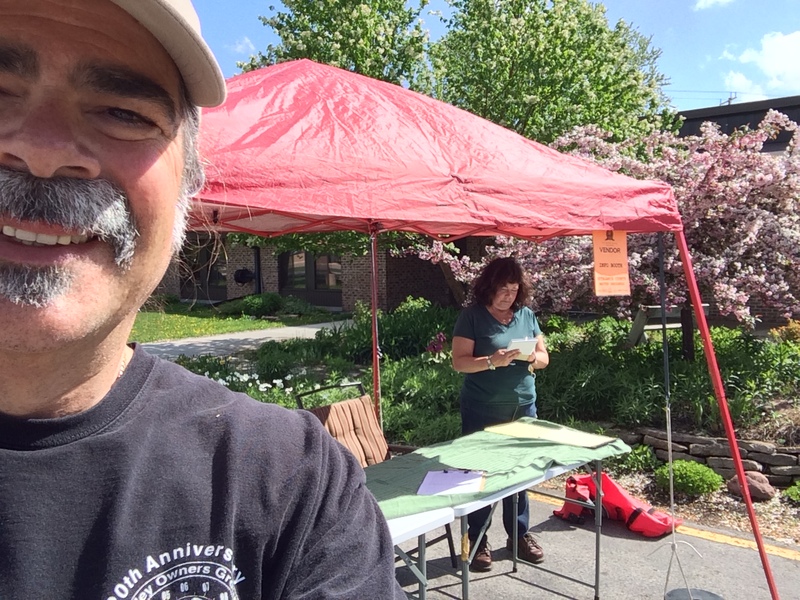 Farm Market volunteer Rich Fischer helps Farm Market Chair Jill Botvinik ready the supplies and lists of equipment for the 2015 Downtown Appleton Farm Market. Each year, the Outagamie County Master Gardener Association volunteers have a booth at the downtown Appleton Farmer’s Market where we greet the public, answer gardening questions, and generally have a wonderful time! The Downtown Appleton Farm Market is held in Houdini Plaza plus the four blocks of College Avenue between Appleton and Drew Streets from 8 a.m. to 12:30 p.m. Saturdays, June 20 through October 31. Please stop to see us! 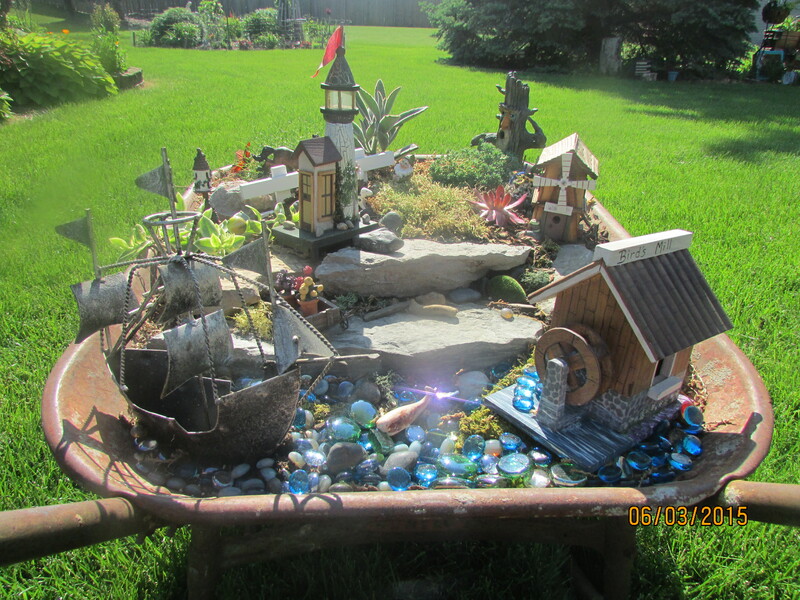 Creating a magical and imaginative fantasy garden like that inspired by today’s popular fairy gardening trend may just be the most fun you have ever had with a wheelbarrow! Hold on to that rusty old wheelbarrow with the convenient no need to drill drainage holes and use it to create a garden within your garden that inspires a tale of make believe, humor and abandon. A setting begs for a story. For example, in the morning I usually head out for a garden walk to enjoy what’s newly blossomed and take account of the late night dinner menu enjoyed by the bunnies in Mrs. McNeubauer’s garden. As I pass by and check out my wheelbarrow garden, I sometimes pause to imagine what the topic of today’s conversation over the fence might be in this mythical seaside village. Also knowing the bunnies that share my garden with me, I wouldn’t be surprised if a furry beast pillaged this little village during the night! Sending its inhabitants off in fear for their lives! See? Find out for yourself that the fun never stops with a wheelbarrow garden and let your creative side do the work! There’s a whole world in there!